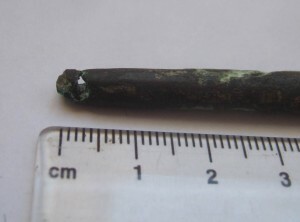 My pin is 97.6mm long, which is substantially longer than the modern pins typically used on early Irish harps today; 3-inch pins (about 75mm) seem to be a typical modern standard. Partly this is perhaps because for example the pins on the Queen Mary harp, which is often copied, are this length; and student versions of old harps often make the neck narrow enough to suit such pins. I would guess a longer pin is intended for a harp with a thicker neck, rather than to have loads of extra sticking out each side. My pin would suit a harp with a neck 55-60mm wide. The drive is square and has parallel sides – this suprised me somewhat as I have been saying for a while that the old drives usually have tapered sides. My pin would suit a tuning key with a 6.75mm socket – significaltly bigger than the 4.75mm usual for modern pins. 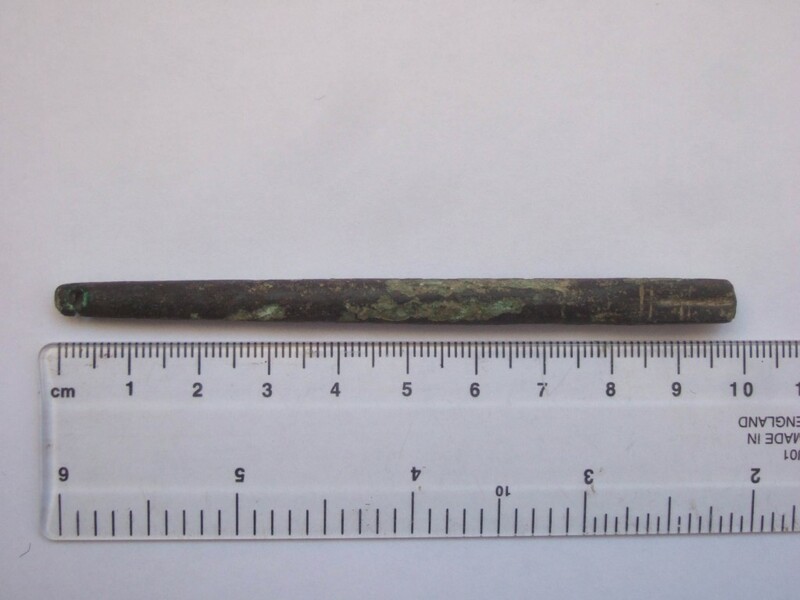 It also has a thicker shaft than most modern pins – about 7mm at the thick end and 5mm at the narrow end. I say ‘about’ because the shaft is not completely straight and round – ignoring the corrosion and damage, it is slightly bulging and faceted. I am interested in how this affects the tuning of the harp. You might instinctively think that a smooth straight taper is easier, but I wonder – perhaps the slight unevenness ‘bites’ the wood of the neck better? Certainly I have had no problems with hand-carved wooden pegs on the jouhikko. The string hole is bigger than usual and slightly off-centred, though this area is the most damaged and corroded so it is hard to tell. The hole is about 2mm dia. In my experience, it is easier to fit a string to the pin when the hole is smaller. 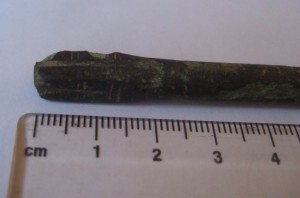 The drive is decorated with two pairs of incised lines running around the pin, as well as a deep wedge shaped groove running the length of the drive. I was pleased to note that these grooves have traces of fine pale brown soil in them from where the pin was dug up, sho wing that it has not been excessively cleaned. The end has an incised diamond, joining these longitudinal grooves. Unfortunately three of the four corners have all been damaged in modern times – presumably being tumbled by the plough before being found. These chipped areas at both ends have green corrosion on them, whereas the original surfaces have a rich dark patina on. 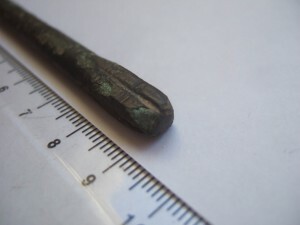 The undamaged, patinated surfaces of the head look quite worn to me, suggesting that this was a well-used pin. It is great to think of this being used by an old harper as part of his harp, and wondering how it got lost on its own. 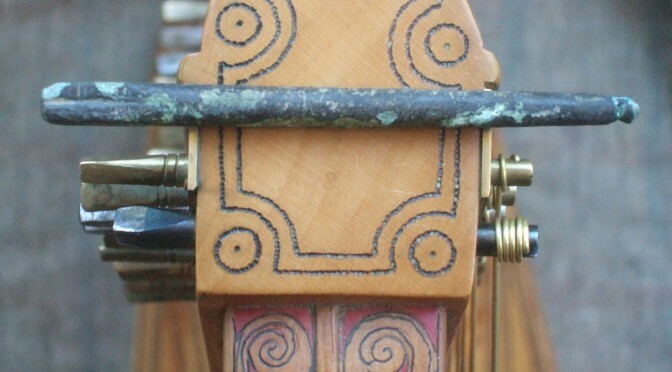 It is also a great reminder of how in the old days, the tuning pins were one of the most expensive and valuable parts of the harp. Now I am thinking of the tuning pins I have been making, and how this new one will feed into that. Is it possible, or worthwhile, using it as a model to get some cast replicas made for people to use in their replica harps?